If you are planning to get your online business off the ground, you need good hosting and are probably looking at SiteGround’s highly praised services. However, just like anything in this world, it isn’t free. Black Friday is, in case you didn’t know, the day after Thanks giving in the US when business and stores offer huge savings on their products and services. But, in order to benefit from these savings you have to be quick, as this offer, starting from today, will only be available for a short time. Before I explain what you actually get when you sign up for Site Ground web hosting, I feel it’s important to discuss why good hosting is so crucial to having a website or blog for your business. There are many ways to get a website to advertise or showcase your business, products or services; however, while all options sound the same, unless you have private hosting, you never really own your site. There are platforms such as Blogger for instance, who allow you to post stuff for free, but if the moderators of Blogger ever have a problem they can take it down as quickly as you put it up. This is why it is always a good idea to pay for separate hosting, through a company like Site Ground. Before you make up your mind whether or not to take this super off for 70% Site Ground’s hosting, it is a good idea to learn more about the company and what they actually offer customers. SiteGround was formed in Panama City in 2004. As a web hosting business it has a staggering 250,000 domains around the world with servers in data centres in 3 countries – the Netherlands, Singapore and of course, the US. Over the last decade it has evolved to be one of the leaders of the hosting industry and offers a variety of services including dedicated server, cloud and shared hosting; using CentOS, Apache, MySQL, PHP and WHM/cPanel to make this possible. The reason I mentioned the location of its three different data centres is because this is one of SiteGround’s strongest selling points. The data centres are strategically located to provide faster speeds for users no matter where they are in the world. You simply choose the data centre and server closest to where your audience and visitors are based, to ensure they have no trouble accessing your content, products and services as fast as they need to. The StartUp Package is specifically targeted at beginners and you are entitled to hosting for one website/blog and receive 10GB of space for that website. This will suit you if you think your site will not have more than 100,000 visits on average a month. The GrowBig package is what you need to invest in if you are planning to build on your websites and company and you can host multiple websites and receive 20GB of space to do so. If your website is likely to get around 25,000 visitors a month, this is the package for you. The GoGeek Package is aimed at you if you are a real internet geek and enables you to host as many websites as you need for your business and gives you a maximum of 30GB to do this. If you know or think your website will have in excess of 100,000 visits every month on average, then you should choose this package. So there you have it. 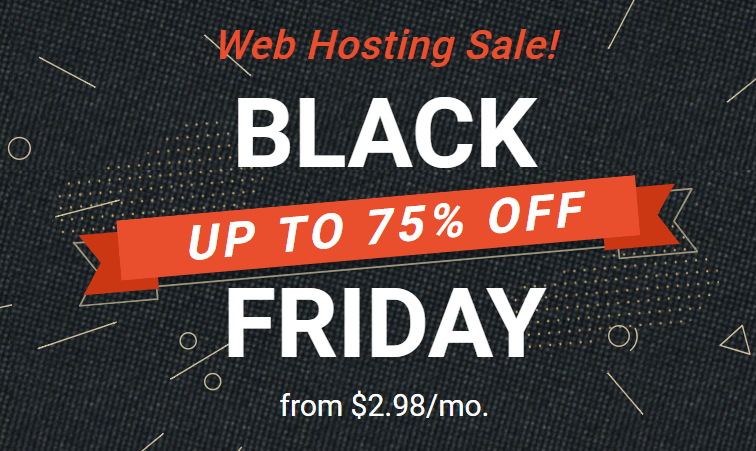 SiteGround’s hosting is popular for a reason and when you take into consideration the sizeable discount you can make today and for a short period only using the SiteGround Black Friday 70% discount it is wise that you think long and hard before dismissing it.